Kenneth MacAlpin or Cináed mac Ailpín (Modren Gaelic: Coinneach mac Ailpein), an is kent in maist modren regnal lists as Kenneth I (dee'd 13 Februar 858) wis keeng o the Pechts an, gaun bi naitional meeth, first keeng o Scots, earnin him the eikname o An Ferbasach, "The Subdewer" lang syne.. He sicceded Drest the Ninth i' Pechtland an wis the first keeng i' Pechtland an Scotland. He ws sicceded bie' Donald I, Keeng o Scots. 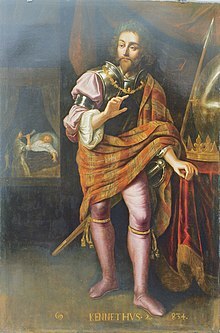 Some fowk consider him tae be thi first keeng o Caledonia but the first keeng ti rule aw o' Scotland wis in the 900's.His reign might i' staerted in 843 but is disputed syne he wis keeng o Pechtland an Scotland. Sae some fowk state his reign staerted in 848. Kenneth wis' weel keent fir' uniting mony Pechtish tribes tae form Unitit Pechtland an Caledonia. ↑ Cináed mac Ailpín is the Mediaeval Gaelic form. A mair richt renderin in modren Gaelic wad be Cionaodh mac Ailpein, sin Coinneach is historically anither name. Houaniver, in the modren langage, baith names hae gane thegither. This page wis last eeditit on 22 August 2018, at 11:20.